The ToryTrack Hybrid smartwatch is the ultimate convergence of Tory Burch design and wearable technology. American lifestyle brand, Tory Burch has launched a new line of smartwatches based on THE COLLINS —a clean-lined, menswear-inspired design that is one of the brand’s bestselling watches. The collection offers four distinct styles that include a navy perforated leather strap with pops of red; a grosgrain fabric strap in a classic navy and ivory colour combination; and gold-tone bracelets with toprings in orange or navy. Tory Burch, which launched in February 2004, is known for its collections of ready-to-wear, shoes, handbags, accessories, watches, home and beauty. The ToryTrack Hybrid smartwatch is a first for the designer. The water-resistant timepiece is the ultimate convergence of Tory Burch design and wearable technology. It has been designed to bring together the elegance and simplicity of an analogue watch with the capabilities of a world-class activity tracker. With the ability to sync to a smartphone via Bluetooth® and a dedicated app, compatible with iPhone® and Android™ phones, features include notification technology, activity tracking and sleep tracking. Our favourite feature is the phone’s ability to seamlessly connect with your smartphone so you can access and control your music as well as take photos wirelessly. Also, the ToryTrack Hybrid smartwatch runs on coin cell batteries, which means no need to worry about charging for at least 4 months. 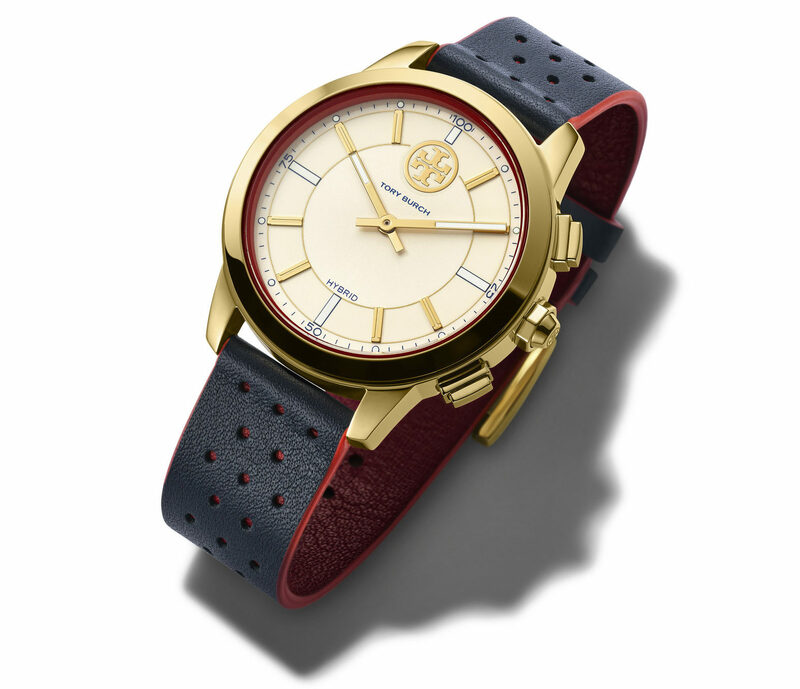 The Torytrack hybrid can be picked up at Tory Burch boutiques, department stores, or on-line at toryburch.com. Prices range from $250 to $295.